"Motum" means motion, and this is a central theme in the 3 pieces by composer Claudio F Baroni on this album. The concept is central to Baroni's work, and is explored musically and formally in his layered, dynamic, sophisticated style. The breathtaking pieces are taking the listener on a meandering path, starting from the origin of sound. Motum is Baroni's second collaboration with Unsounds. With liner notes by Samuel Vriezen. This album is a CD and Digital release. How many voices? How many bodies? How many sounds? Listening to the three pieces by Claudio F. Baroni on his album Motum, I find myself rethinking some basic questions about sound, or indeed, about music. Such as the relationships between sound, body and voice – how to measure these? It’s easy to speak of a “sounding body”, but such a body consists of many internal sound-producing partial bodies, just as “a sound” is always a complex of many actions – of bodies, of the air, of ears and of minds – all extending in space and time. Likewise, as in “one man, one vote”, we ordinarily presume a voice to correspond to a single body. But in music in particular, things are hardly clear-cut. The baroque strategies of alternating registers within single voices by which Bach can create complex polyphonic fabrics from solo instruments, such as in his Cello Suites, are well known; conversely, harmony’s function is to fuse multiple voices into one. If Baroni’s works invite me to revisit such elementary concerns, it is because they propose unexpected variations on the arithmetics of body, sound and voice. Each of these pieces in their own way makes it nearly impossible to tell just how many “things” are present. One quartet fuses into one instrument, yet makes it contain ever more voices. Another quartet seems to project a shadow version of itself and interferes with it, resulting in something like a musical diffraction pattern. In yet another piece, two players play one instrument, creating choirs of voices that are never full, always in between silence and song. A quality of being in-between, I believe, is one of the key aspects that make this music bring up these issues. At first glance, the pieces are clearly stated genre works. String quartet, organ, contemporary chamber ensemble piece. Yet as I get drawn into the music, I realize that underneath these genres, there are hidden landscapes, suspended between solid, fixed references, yet never quite actualizing their limits. Within these landscapes, spectral voices and unmeasurable bodies emerge. Perpetuo Motum is a string quartet in a tradition that also includes works by composers such as Iannis Xenakis, James Tenney, and Margriet Hoenderdos. We hear a world of primary motions that together generate a rich panorama. Yet the details are not easy to grasp, since it is almost a double piece, as if each performer of the Prometeo Quartet is playing in two groups at once. Whenever a player plays, it is on two strings: one stable note on an open string, and one slow glissando on a neighboring string. The result is a fascinating superimposition of two incommensurate musical logics. On the one hand, drone harmonies based on open fifths; on the other hand, a Xenakis-like world of pure glissando counterpoint, not based on harmony at all. Yet the piece sounds like neither, or maybe it is a superposition of both (in the quantum mechanical sense). What I hear is neither stable harmony, nor pure disharmony. Rather, I hear an unpredictable mist of harmonic tendencies, a pure field of variation on a background chord that never becomes explicit, consistently hinting at different tonal worlds. The dynamics in each part are in flux as well, with at times one part briefly coming to the fore in a relatively loud entry. As a result, I hear a block of sound, two quartets, four parts, eight voices, or uncountable less tangible acoustic phenomena that result from interferences between them all. "Perpetuo Motum" gives me a sense of pure motion, preceding any definable trajectory and any positive moving “thing” as such. Solo VIII – AIR similarly moves between categories: those of Organ and Silence, to use a title of a composition by Tom Johnson. If in Johnson’s work, the two are mutually exclusive – you either hear organ or silence – in Baroni’s, they determine boundaries between which the sound moves. Pedals and manual keys are pressed down during the piece, but it’s not quite notes we are hearing. Instead the piece consists of registration changes, the knobs for registers being manipulated very slowly, and never fully pulled out. The result is a subdued, unpredictable, fluctuating sonority, an almost-organ, the sound of a complete choir of partial voices, with sometimes hints of a tone emerging. What voices are these? The title’s double meaning suggests an answer. From the organ’s body comes a song of the element itself. The last, and longest, piece on this disc is In CirCles II. I hear beautiful chords, subtle instrumental detail, hints of rhythm and motivic motion, an atmosphere that reminds me of Morton Feldman – maybe more of a regular piece of contemporary music? Yet this piece, too, is in a constant in-between state. We hear the sonorities undulate, instruments moving between two pitches, the slow meter gently alternating between time signatures. Even the four movements as a whole move back and forth: except for many details of instrumentation, the third is the first transposed down a major second; the fourth is more loosely related to the second, using the same harmonic material, a fourth lower. The odd movements rely more on alternations between pitches in the instruments, the even movements on pulsating motives of repeated sonorities. Each movement sounds like the internal variation of a single sonority, and indeed, behind every movement, there is the sound of one Asian percussion instrument – gong or tam tam. Those sounds were analyzed by Baroni to generate sonic worlds specific to each movement. In this sense, the quartet recreates an extremely slowed-down version of just one sounding body. But in the process, extra voices and effects result. Through subtle shifts in timbre and register, tiny variations in intonation of common pitches start acting between the instruments, along with the acoustic effects of the intervals and overtones themselves. Inside each sound, I become aware of multitudes of processes, of emerging micro-voices. How many voices? How many bodies? How many sounds?. Listening to Claudio Baroni’s music makes me unsure how to tell: but from within the sound, I do hear countless bodies and voices sing. — Samuel Vriezen, Amsterdam 2018. 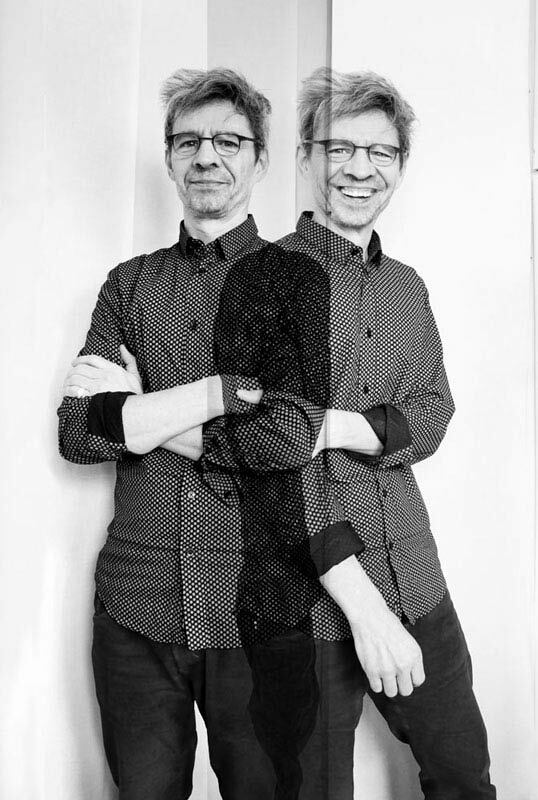 Claudio F Baroni 2018 - photo by Isabelle Vigier.